Rumah Sakit Umum Daerah Kota Depok - RSUD Kota Depok is a well-established regional government owned general hospital in Indonesia, based in Depok, a City in the West Java Province. 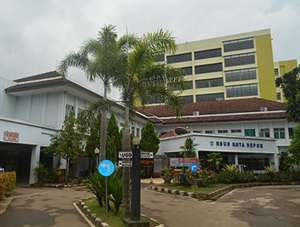 RSUD Kota Depok is fully-owned by the regional government of Depok and is the only government-owned hospital in Depok City. According to information found in RSUD Kota Depok's website as cited by JobsCDC.com, RSUD Kota Depok was established on 17 April 2008. RSUD Kota Depok occupies a land area of 29,378 m2. Currently, RSUD Kota Depok has installed total 71 bed capacity (TT), consisting of 54 class III care beds, 4 second class treatment beds, 9 bed perine care, and 4 bedding isolation treatment. While for outpatient, RSUD Kota Depok has 12 specialist clinics consisting of internal, child, obstetric and gynecology, psychiatry, nerve, anesthesia, eye, ENT, lung, dental and oral surgery, and radiology. Minimum age of 18 years and maximum 35 years old. D3 Nursing or Ners Profession from a reputable University with minimum accredited B.
Preferably have experience for minimum 3 years (D3) and 2 years (Ners). Preferably have attended training in BTCLS, ACLS, NICU, ICU, HCU/PICU. D3 Pharmaceutical from a reputable University with minimum accredited B.
Preferably have experience for minimum 2 years in the related field. D3 Health Analyst from a reputable University with minimum accredited B.
D3 Medical Record from a reputable University with minimum accredited B.
D3 Electromedics from a reputable University with minimum accredited B.
D3 Nursing Anesthesia from a reputable University with minimum accredited B.
JobsCDC.com now available on android device. Download now on Google Play here. Please be aware of recruitment fraud. The entire stage of this selection process is free of charge. Rumah Sakit Umum Daerah Kota Depok - Non CPNS BLUD RSUD Kota Depok February 2018 will never ask for fees or upfront payments for any purposes during the recruitment process such as transportation and accommodation.